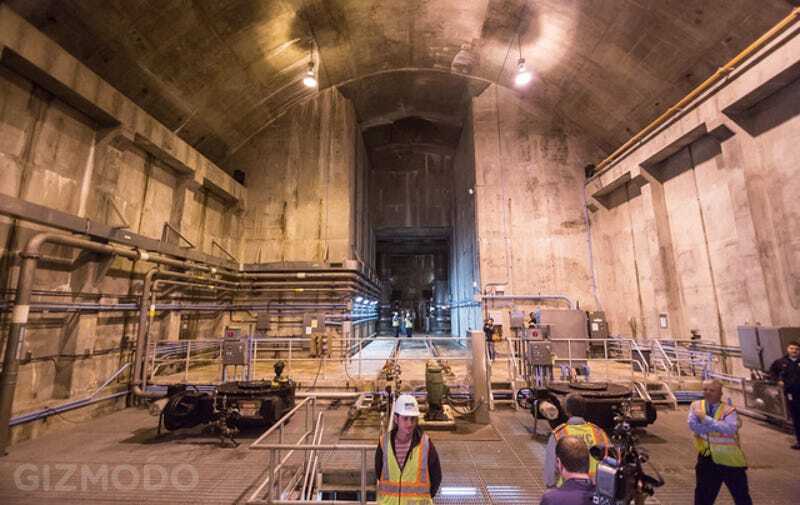 At 5pm today, the complete Manhattan section of City Water Tunnel No. 3 became operational, sending drinking water through this colossal piece of subterranean infrastructure—under construction since 1970—for the very first time. To mark the occasion—an historic event for the city—mayor Michael Bloomberg hosted a press conference two hundred feet below the surface of Central Park. It was to remain, we were reminded again and again, even by the mayor himself, an undisclosed location; we were not allowed to tell anyone where we were. And you would never guess that this is what lies there—on the other side of a non-descript door you've probably already been past without noticing—that, after a short elevator ride sliding sixteen stories down, deeper than most subways, you would find this astonishing vaulted room. When he took the microphone, Bloomberg's first words of welcome were a reference to the city's geology, noting that we were "surrounded by Manhattan's 400-million year old bedrock," as if we'd come down to stand together inside the island metropolis he has spent the past 12 years governing. For a mayor facing his final weeks in office, this was a momentously timed project to complete, but also a fitting tribute to the Bloomberg administration's investment in infrastructure (the tunnel alone has cost $5 billion). Waiting for Bloomberg to arrive was an unexpectedly interesting experience, at least for this writer for whom today was my first mayoral press conference. Hives of journalists buzzed around civil engineers wearing yellow safety vests, as TV camera crews filed into place, monopolizing all the best views, some times pushing past one another, amongst the relief valves and auxiliary pumps, to wait impatiently for the moment—the money shot—when Bloomberg would finally arrive by elevator here with us in the underworld, and he would walk toward us down the central nave. Gizmodo's staff joked that it was like waiting at a wedding for the bride to arrive, but it somehow felt more royal than that, and weirdly exaggerated: as if the ruler of all that is above had come down to inspect this placeless valve chamber, this vast mechanical room hidden in the earth, controlling things secretly from below. It was Bloomberg amongst the valves, the king amidst his machinery. With a multi-story concrete barrel vault towering over us and two smaller chapel-like spaces waiting on either side, it felt Romanesque, minimalist, and, in its own spacious way, almost overpoweringly civic. The ceremony of it all included press agents, their badges displayed on neck chains, with well-suited security staff standing off to the side, watching us all without ever making direct eye contact. And so, for nearly an hour, we milled around like that, wandering back and forth through this buried cathedral of water-control technology at the heart of the city, taking notes, prepping our cameras, and occasionally sitting down in one of the blue plastic fold-out chairs placed there in the mustiness for us to use. —and the walkways of the central room itself were steel grates that felt less like a floor in any real, architectural sense and more like an arbitrary level simply plonked down in the room wherever the engineering allowed for it, just a viewing platform for inspecting the bits and bobs of machinery poking out from beneath. Looking down through the grates, tiny caged bulbs reflected in puddles, at times creating the optical illusion of even deeper basements, levels seemingly out of synch with the floor plan. Because, after all, we were all there for water—and there was plenty of it. Beneath the reverb of voices from what seemed like every TV crew in New York City, there was a constant drip of water in the chamber below, pattering down onto concrete and running in small rivers down the walls. Algae blooms were spreading across any surface where a light bulb shined, the chamber's own fluorescent-lit ecosystem literally coming to light in this underground environment. So this chamber holds the valves that will control the flow and distribution of fresh drinking water coming down from the Hillview Reservoir, fanning out from Tunnel No. 3 to homes and buildings throughout Lower Manhattan. Seeing as how the tunnel has been under construction for the past 43 years, a representative of the "sandhogs" who built and excavated the structure was there to speak about their honorable—and extremely dangerous—multi-generational role in seeing this through to completion, how they removed enough rock and rubble, for instance, to fill Madison Square Garden 200 times over. In fact, one of the most interesting parts of the day was when Bloomberg handed the microphone to one of the city's hydrological engineers, who proceeded to describe the ghosts of water projects past: tunnels, aqueducts, reservoirs, and old water mains that have long since disappeared, artificial bodies of water that no longer appear on maps. They have been built over or simply dismantled, he explained, but, in all cases, they've been replaced by modern systems and more efficient distribution networks. Listening to this role call of lost infrastructure imparted a nice narrative cap to the experience of the day, as if all things hydrological had led here, to this pharaonic and echoing space an elevator's ride beneath Central Park. In any case, here are a few more shots of the day, showing the room itself, Mayor Bloomberg, and many of the machines on view. Thanks to Michael Hession for the images!